AVR-X7200WA is rated 5.0 out of 5 by 5. Welcome the new leader of the 2014-2015 Denon AVR range. Featuring ultimate build quality with a left/right-separated monolithic amplifier design and custom made DHCT (Denon High Current Transistors), the AVR-X7200WA guarantees best-in-class sound quality with minimum interferences. Thanks to built-in Wi-Fi and Bluetooth, it is perfectly set for all network services including Spotify Connect, AirPlay, Network Music Streaming and Internet Radio. Via its 8 HDMI inputs (including one on the front panel) it handles 4k 60Hz pass through playfully, and even upscales video to 1080p and 4k 60Hz. All HDMI feature full HDCP 2.2 compatibility with HDR – High Dynamic Range – and extended colour space BT.2020. Now add brandnew Dolby Atmos, triple HDMI outputs with multi-source/multizone functionality and integrated Audyssey MultEQ XT32/Sub EQ HT/LFC to guarantee the ideal calibration of your setup. 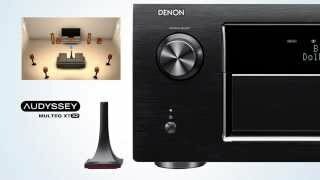 The unique Denon Link HD function, guaranteeing the ultimate in entertainment pleasure works in combination with AL32 Processing Multi Channel and DDSC-HD32 for higher resolution audio playback. All sums up to the most comprehensive AVR experience we are pleased to offer. The AVR-X7200WA lets you enjoy a program source in the Main Zone (the room where the AVR-X7200WA is located) and in Zone 2 and Zone 3. The source can be the same for all zones, or you can enjoy different sources in those zones if you prefer. The sources for the zones can be either analogue or 2 channel digital PCM sources (incl. optical, coaxial, HDMI and network). Denon’s exclusive Setup Assistant, along with our Quick Start guide, will have your system properly connected and configured quickly and easily, so you can start enjoying superb home theater surround sound with a minimum of fuss and bother. The Setup Assistant features clear on-screen graphics and text that quickly and easily guide you through the setup process, optimizing critical system settings for the best possible sound quality. With each channel rated at a maximum power of 210 watts, the AVR-X7200WA features a left/right-separated monolithic power amplifier design with Denon custom made transistors and identical circuit topology on all 9 channels. Our new Eco Mode provides the ability to reduce overall power consumption and features an on-screen Eco Meter that lets you see the power consumption reduction effect. The Auto Eco mode automatically switches between normal and Eco modes, depending on the volume level chosen, and the power amplifier block is rated to drive low impedance speaker loads, down to 4 ohms, for compatibility and stability with virtually any loudspeaker model. It is the most accurate room correction solution with more than ten thousand individual control points allowing finer details of the room’s problems to be captured and corrected. The ultra high resolution filters are applied to all channels including the two independent subwoofers, with the most obvious benefit being heard in the low frequency range where correction is needed the most. Audyssey LFC uses psychoacoustic algorithms to prevent bass from passing your walls and disturbing your neighbours while maintaining the bass performance in the listening room. The AVR-X7200WA is also Audyssey Pro ready for the most advanced professional room correction. With Dolby Atmos, sound comes alive from all directions, including overhead, to fill the home theater with astonishing clarity, power, detail, and depth. The AVR-X7200WA has the processing power to run a more enveloping, Audyssey MultEQ XT32 calibrated 7, 9 or 11 channel Dolby Atmos layout using 5.1.2, 5.1.4, 7.1.2, 7.1.4* or 9.1.2* configurations utilizing ceiling mounted, or Dolby Atmos-enabled speakers. A 5.1.2 speaker configuration is based upon a traditional 5.1 speaker layout complemented by 2 overhead or Dolby Atmos-enabled speakers. A 5.1.4 configuration is based on a 5.1 speaker layout with 4 overhead, or Dolby Atmos-enabled speakers. A 7.1.2 or 7.1.4 configuration is based on a 7.1 speaker layout with 4 overhead, or Dolby Atmos-enabled speakers. A 9.1.2 configuration is based on a 9.1 speaker layout with 2 overhead speakers. (* with additional power amplifier). Many portable devices are equipped with Bluetooth wireless connectivity, and the AVR-X7200WA’s built-in Bluetooth wireless technology lets you stream your favourite audio tracks from up to 8 Bluetooth enabled devices, such as smartphones, portable audio players and tablets. With the built-in Wi-Fi wireless technology, the AVR-X7200WA connects to the internet through your home network, opening up a world of music from internet radio stations, as well as streaming subscription service Spotify via very latest Spotify Connect scheme. With AirPlay, you can enjoy listening to your tracks wirelessly from your portable iOS device, including iPhone, iPod touch, and iPad. DLNA 1.5 certification lets you connect to your PC or Mac via your home network wirelessly for additional streaming capabilities. Our Denon Remote App lets you easily control the AVR-X7200WA with your portable device, and is available for Apple and Android devices as well as the Kindle Fire. Dolby's new Atmos surround sound technology dispenses with channel-based coding in favor of more advanced object-based coding, giving the sound designer the ability to precisely place sounds anywhere in the 3-dimensional space. Now, you can enjoy this same award-winning technology at home with the AVR-X7200WA, which features the ability to connect a 5.1 surround sound speaker system and 4 additional overhead speakers or 4 additional Dolby Atmos elevation speakers for the ultimate home theater experience. Thanks to the 11ch processing capability, you can just add an external 2-channel amplifier and even enjoy a thrilling 7.1.4 or 9.1.2 channel Atmos experience. Along with Dolby Atmos decoding and Dolby Surround Upmixing, the AVR-X7200WA also features Dolby TrueHD lossless decoding and other Dolby Digital technologies. The latest immersive surround sound system, DTS:X, features object-based audio coding that lets the sound designer place sonic elements anywhere in the 3D acoustic soundspace, and provides for overhead speakers to deliver a stunning surround sound experience, and the AVR-X7200WA also features DTS-HD Master Audio and other DTS technologies. DTS:X and DTS Neural:X Upmixer will be enabled through a future online firmware update. For more info, please visit www.denon.com/dtsx. Eight systems are provided for the 4K video signal supporting HDMI input. One of these systems is located at the front so that you can easily enjoy video from a movie camcorder, game console, or smart phone. The HDMI output has a new terminal for zone output in addition to 2 systems capable of simultaneous output to allow the HDMI input video and audio to be output to a sub-zone. The AVR-X7200WA also features full HDCP 2.2 compatibility, a requirement for 4K Ultra HD copy-protected content. In addition HDR – High Dynamic Range – and extended colour space by standard BT.2020 are supported. Rated 5 out of 5 by Biglegs from Awesome receiver sounds amazing It was time to upgrade my Onkyo TX NR1007 - I spent days reading reviews in the home cinema mags and on av forums and finally made a decision to go for this Denon AVR 7200WA. I am so glad I did, it is awesome and worth every penny, I was even lucky enough to get money off in the Christmas sales but I would still pay the price it is now back upto. I also treated myself to some dolby atmos speakers giving me a set up of 7.1.2 the difference is incredible. There is plenty of power to drive all the speakers even when watching a movie via blu ray where there is lots of action, objects really do sound like they are flying around the room and over head. I have had the volume setting no where near its max so there is lots left not sure if the windows will take any more though. Music from my iTunes library over blue tooth is also fantastic especially when using the Pure function which switches to stereo. The dialogue from the centre speaker is crisp and clear. The setup process out of the box was straight forward, it takes you through each stage step by step. After the initial set up you can then fine tune the speakers using the Odyssey set up microphone this also was a doddle. It is a heavy piece of kit nearly 18kg and is well built, it really does feel sturdy and it looks great. The remote feels well made in the hand and an added bonus it lights up when you touch it, so when you are in a dark room you don't have to find a button to make it light up. Denon really do seem to have thought of every thing. When I was doing my research I couldn't find any dealer who could give me a demo of a high end amp so I agonised for ages before deciding to change to a Denon. This was a decision not taken lightly but one well made I am so pleased with my purchase. I would recommend this amp to anyone who is serious about home cinema. Rated 5 out of 5 by Alanrob13 from Does everything I need Easy to setup, has all the features needed. Running a 7.1.4 speaker setup and the sounds is fantastic. Everything connected to this unit and using a Harmony remote, switching to the different sources is easy. From 4K movies to on line music and in built TV apps, nothing's phases it. Connection via the latest HDMI cables ensures no handshaking issues. Hoping now that future features become available for this top of the range piece of kit. Rated 5 out of 5 by Icecapuk10 from Awesome features on this unit Moved over from a Yamaha pre and power and couldn’t be happier. AV Forums - "Denon AVR-X7200W 9.1 AV Receiver Review: It's a superb AV receiver that even has the X factor"
"In terms of its price tag, the X7200 is one of the more expensive 9-channel AV receivers but there is nothing we have reviewed to date that out-performs the Denon"
"In fact in overall performance terms, the X7200 is one of the best Dolby Atmos receivers on the market.....if you do decide to buy the Denon AVR-X7200W, you certainly won't be disappointed." "This is undoubtably a smashing sounding AVR, but the confidence-inducing architecture Denon has emplyed beneath the lid may yet prove to be its biggest claim to fame." Home Cinema Choice - "Revamped Flagship"
"Owners of Denon's top-end AVR-X7200W will soon be able to upgrade it to support HDCP 2.2 copy protection, ensuring compatibility with forthcoming 4K video sources"